I haven't really sent any through the mail (TTM) autograph requests since the early '90s, when, as a 13-year-old kid, I did on a somewhat regular basis. Most of mine were failures, primarily because I'd send cards that were a couple years old to the players c/o that teams that they were depicted playing for on the cards, not knowing that they were long gone from their former ballclub. I did get a couple of good ones, though. I sent a Topps Black Gold card to Dave Winfield when he was playing for the Twins. I received the card back, unsigned, but along with it, an autographed postcard, which I have, since then, misplaced. I think my dad agreed to hold onto it for safekeeping, but I have no idea where it is at the moment. That's right. The greatest basketball player of all time, through the mail, for nothing more than the cost of a couple of stamps and a couple of envelopes. At the time, I didn't realize how big of a deal it was. I just figured I got a pretty good autograph of a really good player. Looking back on it, I realize how lucky I was. For one, the timing was good. 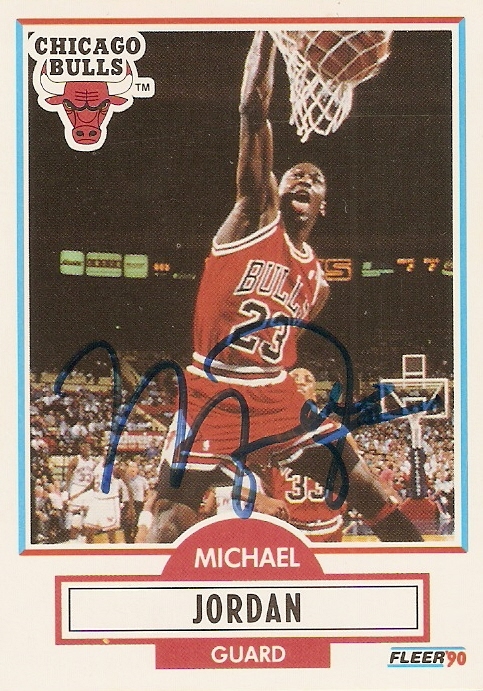 I sent it out, I think, the year before the Bulls won their first NBA Championship, so while he may have been receiving plenty of requests, I'm sure they were nowhere near the amount that he would eventually receive. Second, I was 11 or 12 at the time, so I'm sure a handwritten letter from a young kid went a little bit further than a type-written letter from an adult. Still, no matter what the circumstances, while I am not that much of a basketball guy, I would say it's one of the cornerstones of my card collection. If I could show off one card out of the thousands that I have, this would be it, plus there's a little bit of a story behind it.